It’s been a long time since the last Devil May Cry, following on from the original series instead of the mixed reception that was the reboot, Devil May Cry aims to bring the series to current gen with all the style and OTT experiences one would associate with the premier devil slaying series. Does it pull a SSS rank or does it brings tears to the evil almighty himself? Read on to find out!. 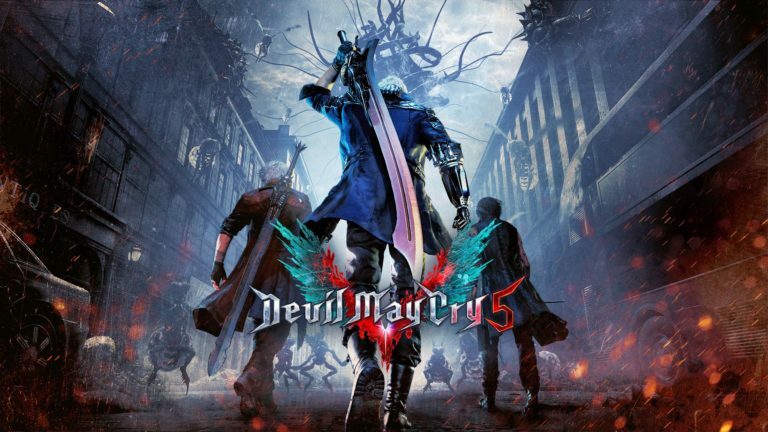 Devil May Cry 5 follows the exploits of Dante, Devil May Cry 4s Nero, and newcomer V as they fight their way through Redgrave city which is currently being consumed by a giant Demon tree called the Qliphoth. The game follows a timeline that has a tendency to jump back and forward as events transpire, even starting you a quarter into the timeline. It’s not confusing to follow as it clearly states the dates and times and the mission list slides into chronological order should you need further clarification. The story manages to top it’s self over and over again through the 20 mission campaign which clocks in at around 10 hours on your first playthrough. 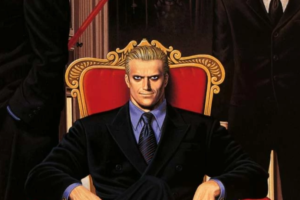 Dante is his loveable, goofy, wisecracking self, Nero is reminiscent of the younger Dante from DMC 3 and dare I say takes a few aspects from Reboot Dante & V is a poetry reading, My Chemical Romance blasting, Hot topic shopping emo kid with more than a slight air of mystery about him. 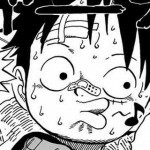 The characters all have fantastic interactions with both each other and the supporting cast of newcomer Nico, the wisecracking women with attitude, Lady & Trish and the familiars that V summons, one of which has some scene-stealing lines!. The story builds to quite the climax and despite not feeling quite as epic as it could have been & for some reason Capcom putting a major spoiler in the launch trailer the payoff, for the most part, is a rewarding tale with just a few questions left over. 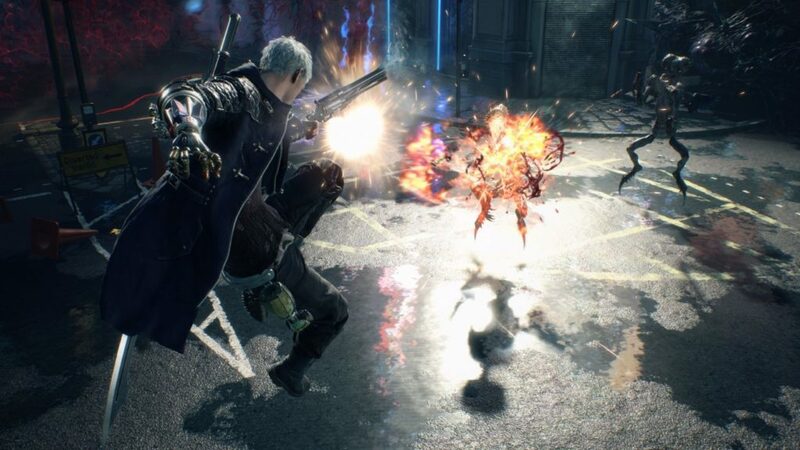 Graphically Devil May Cry 5 is one of the best looking games around, it runs on the RE Engine which powered both Resident Evil 7 and Resident Evil 2: Remake and I would go on record to say that there are a few points where it even blows those titles out of the water with its visuals. The facial animations are superb in cutscenes, enemies have never looked more grotesque and the scenery is the most varied and vibrant it has ever been. All in all, Devil May Cry 5 is a stunning looking game that manages to run at 60fps the majority of the time making it not only a feast for the eyes but the smoothest ride around. The voice acting in Devil May Cry 5 is outstanding no matter what dub you choose, I personally went with the English dub and even though I wasn’t too keen on Nico’s Texan twang originally she grew on me throughout the adventure. 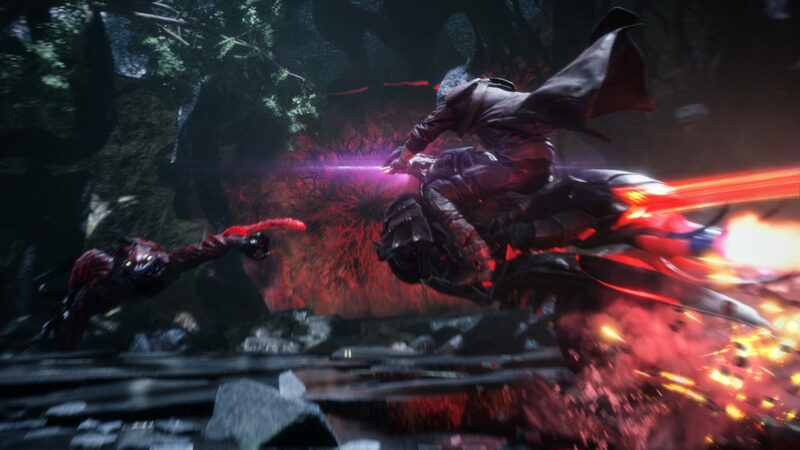 The music is also a huge bonus with this title if you play better the music gets better and let’s face it, we should have all heard Pull My Devil Trigger by now and why wouldn’t you want that booming out while juggling monsters around the place!. Onto the real meat of Devil May Cry 5, how it plays. 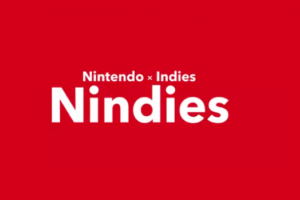 If you have played the series before it’s the same premise as always, 20 missions where you’ll be platforming, hack and slashing and shooting your way around linear levels with secrets to be found and Red Orbs to horde. Said Red Orbs can be used to purchase upgrades and some items, one of the key points to note here is consumables are gone, Yellow Orbs play a more prominent role and can be found quite readily, plus you get one each time you log on so you are given more than enough tools to help you through your time even if you are in the habit of falling back on Healing Stars. Nero has had a tweak since his debut and now has many different arms with different abilities which command your play style, these range from shooting outbursts of lightning, healing to even MegaMan’s trusty MegaBuster. It’s always worth keeping a healthy stock of arms as they have the tendency to break quite easily, or you can break them yourself to thin the horde and switch to another arm. Nero really stole the show in terms of gameplay in this title, as fun as Dante was, Nero managed to excel above this, between his arms and the sword he uses which can be buffed mid combo for extra damage, playing as Nero really gives you every tool and more. Following Dante and Nero up is V, he’s wildly different from both previous characters and what you would expect from the genre in general. He is very hands off and uses his familiars to attack foes rather than getting his hands dirty. 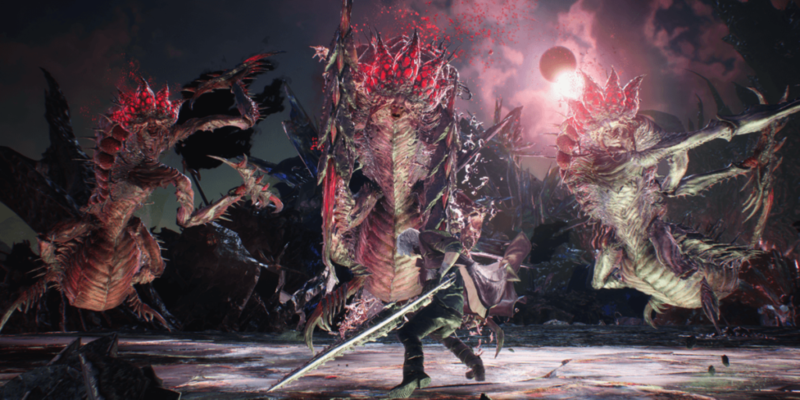 Comboing with the familiars is insanely rewarding but you can’t be too far away from the action as the kill shot has to be done by V himself, he also has a risk/reward feature in that you can make him read poetry to build Devil Trigger, it causes enemies to aggro over to him but build enough DT and you can summon his final familiar Nightmare, he’s a room clearing, damage dealing, monster of a tank and well worth putting yourself in danger to summon. The campaign has a few pacing issues with some levels slightly dragging whereas others are over in a flash but in the grand scheme, it’s a minor issue at best. There are plenty of unlockable bits of lore for you to glance over and as always a plethora of difficulties for you to tackle should you be craving even more time with the crew. 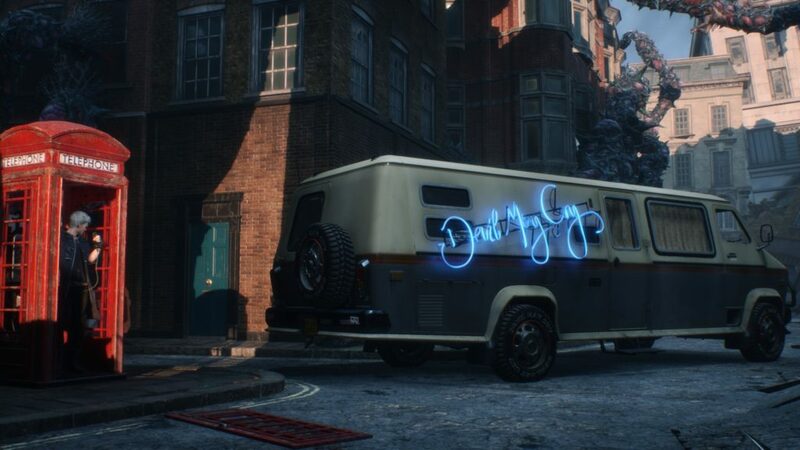 Devil May Cry 5 is one of the few titles in the past few years where the credits had rolled and I was already on my way back to Redgrave on the next difficulty. Whatever is in the water at Capcom lately is certainly working, Resident Evil 2: Remake is already well on it’s the way to becoming THE king of its franchise and Devil May Cry 5 has come around and asked it to hold it’s pint of demon blood. Devil May Cry has never, looked, sounded, played or been better, Bayonetta has always been my personal favourite of the genre but I’m more than thrilled to say that Dante has usurped the queen with this latest adventure and produced 2019s second MUST PLAY title. Long may the devil cry.